In 2011 after I purchased my first splitboard (See here) I decided I should build on my basic skills for backcountry travel and I partook in a New Zealand Mountain Safety Council course about backcountry travel. Probably one of the better decisions I’ve ever made as it really boosted my confidence about getting out there after I was caught in a large avalanche while snowboarding in the backcountry near Lech am Arlberg in Austria. 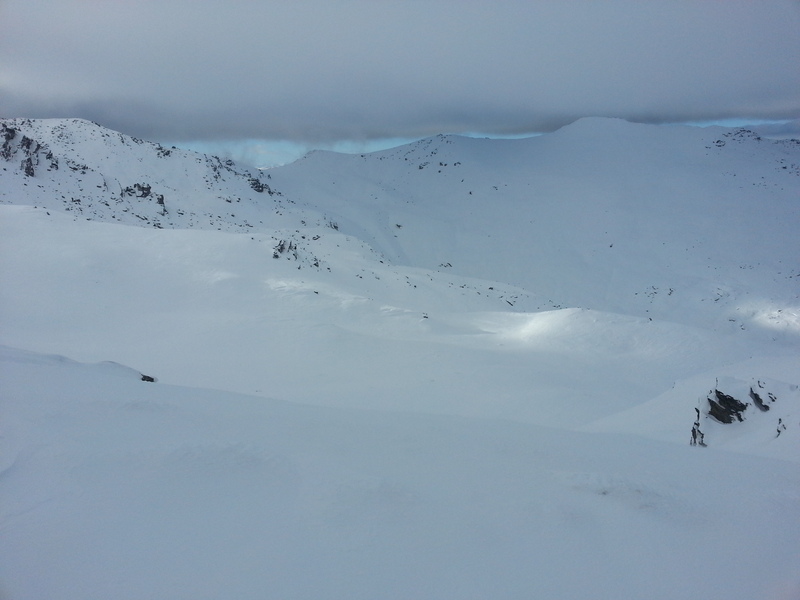 The course was taught by the head of ski patrol from the Remarkables Ski area and took place in the Wye creek and Doolans areas behind the ski area. The first day out in wye creek i spotted it, Looming above us from our lunch spot. Motivation if I ever saw it. I got home and a photo of it became the wallpaper on my computer. Motivation to get out there and ride it. For various reasons last year wasn’t to be the year. After seeing it in prime condition earlier this week, I had to get out there and ride it. Everything lined up and saturday was to be the day. My usual BC buddy Todd had seen a photo of it i put on Facebook and was keen to get involved. After a late start we were skinning up the South Wye col above Lake Alta towards single cone. Saturday was busy in the back country. 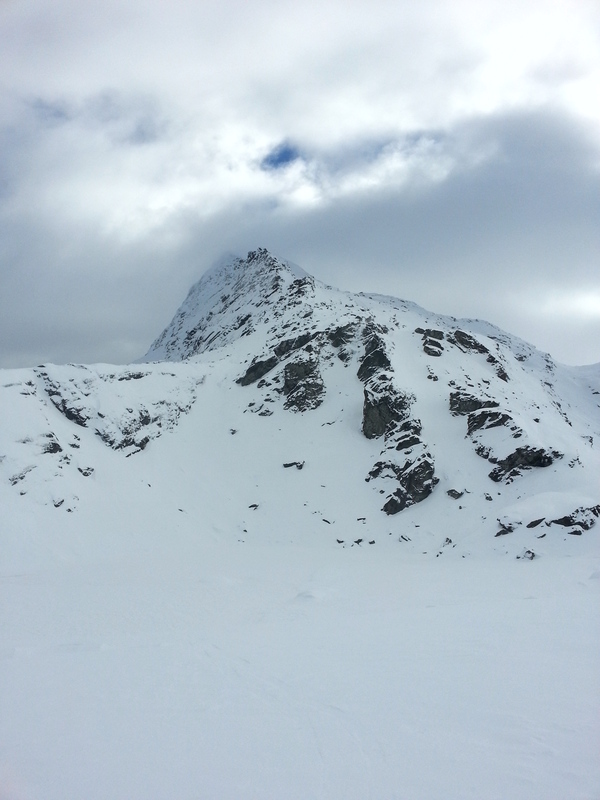 A lonely snowboarder post holed away above us and when we reached the col, 3 skiers entered from the valley below. The thought crossed My mind, But I brushed it off. 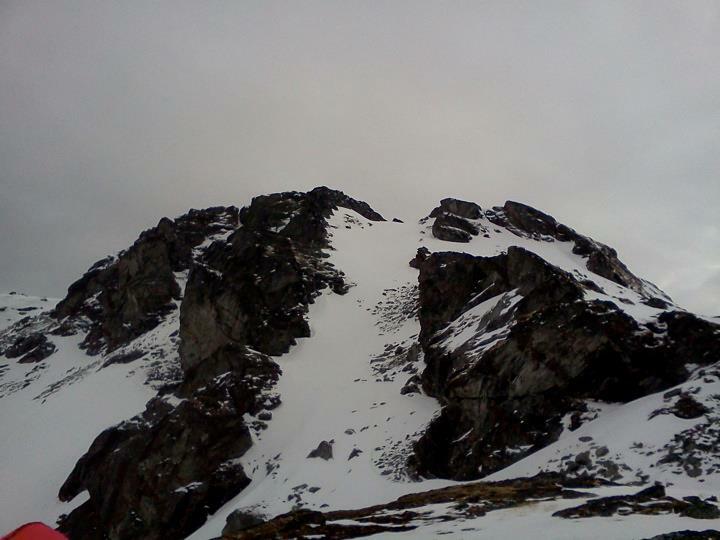 Upon reaching the plateau below Single cone we skinned over to where I thought we could ride down to gain entrance. Skier tracks in a similar direction, Again I brushed it off. We changed over and rode down some fantastic deep dry snow in fun, gully style terrain with banks to slash and rocks to pop off, the only negative was the chunks of water ice that had blown onto the surface of the snow in places from near by rocks. My thoughts to stay high on the ridge were terrible and after a bit of billy goating we had found it. And the skiers tracks were straight into it! Oh well. Its still gonna be fun. I wanted to check the pack as I like to be cautious about these things. A 15cm surface layer broke from 5 taps from the elbow on the isolated column. I wasnt too worried. Todd got to be guinea pig and drop in first as i snapped a few photos from the top. The light had gone flat at this stage and we both rode it rather cautiously. Bits of breakable crust sloughed behind but it wasn’t enough to be an issue, Just an annoyance in the flat light. The one line had taken a bit longer than we had anticipated but it was a fun day out and I got to tick something off the bucket list thats been on there for a long time!